The National Cancer Registration Service (NCRS) collects information about every patient diagnosed with a malignant tumour in England. You can read our blog on the importance of using this data. Now, through an innovative project, patients can also access this information. Back in 2012 a group of brain tumour patients asked for online access to the records that the National Cancer Registration Service held about them. Since then we have been working with Cancer Research UK, the brain tumour charity brainstrust, patients and healthcare professionals to make this possible. The Patient Portal is a secure online system where patients can access the records held about them by the NCRS. Patients can view various types of information, including reports on tissue samples and scans, data on radio and chemotherapy and information about their attendance at hospital and treatments. Alongside this, the portal has a quality of life tool, space for users to add their own notes, keep a list of contacts and directory of links to helpful information about support, treatment, clinical trials and research. 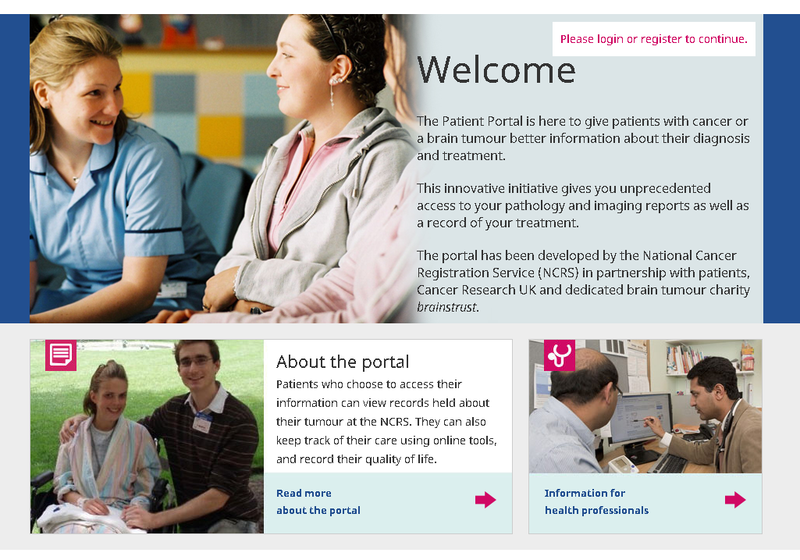 A pilot began in November 2013 for brain tumour patients and in July 2014 we extended to other cancer types with eleven clinical teams across England offering the portal to patients with melanoma, brain, colorectal, prostate and kidney cancer. Providing patients with their cancer records lets them process the information at their own time and pace and read it in-between appointments. In turn this allows them to have more informed conversations with their clinical teams and carers. As well as potentially helping patients to understand their own diagnosis, it also allows a patient to tell us if some of their records are missing or incorrect, thus improving the accuracy and quality of the data we hold. We wanted to understand whether patients would use the system and how, the benefits that they would get from accessing their records, what support they would need and what the impact on the clinical teams treating them would be. We found that around a quarter of those asked wanted access to their cancer records - a larger proportion than expected. By the end of the pilot in March 2015, 88 patients had asked for access to their records and 50 had accessed them. Although numbers are relatively low, the users were positive about the service and 86% would recommend it to others. Our Pilot Phase Evaluation Report, which has full details of what we did, is available online. We have shown that patients would like to use the portal but need to work on how we can offer this to a much larger number of patients. Eventually we would like every cancer patient in England to be able to access their own cancer registry record if they choose. To help us achieve this, we will be working to make cancer registry records available to users of Patients Know Best. Patients Know Best provide a patient held record designed to empower patients to manage their care and help clinicians share information and engage with patients in powerful new ways. By allowing users of Patients Know Best to add their NCRS records easily we will increase the number of patients who can benefit from this service. It will also allow them to manage all of their healthcare records in one place. This is a big step towards being able to offer every cancer patient access to their own registry records and supporting information. We aim to have the link to Patients Know Best in place by the end of 2015 and we look forward to being able to report back on progress.